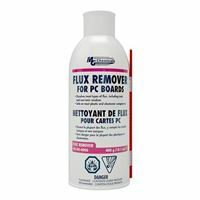 Flux Remover for PC Boards - 11 oz. The 4140 Flux Remover for PC Boards is a blend of ethyl alcohol, isopropanol, and ethyl acetate that is an eco-friendly dry cleaning solvent. It has a non-corrosive and non-conductive formulation with a moderate dry time. Since the 4140 is safe for most plastics, seals, heat sinks, and printed circuit board components, it is used heavily in the electronics industry. It is great for removing rosin, non-rosin, no clean fluxes, and ionic contamination. It is generally compatible with plastics, seals, PCB components, paints, rubbers, and plant fibers. RoHS Compliant Low odor Safe on most plastics Moderate dry time Zero residue.